This album has been released and re-released with various titles and various cover-designs over time. It's generally considered Bowie's first rock album. The 1969 original versions were released on Philips and titled "David Bowie" while the concurrent North American (US and Canada) releases on Mercury had a strap line "Man of Words/Man of Music" at the top of the album. Although Mercury still cataloged it as "David Bowie" it was commonly called by the strap line and when RCA repackaged and re-released it in 1972, they erroneously referred to this advertising title. Both Philips and Mercury releases use images from the same 1969 portrait photo-shoot on the front cover, but as the Mercury image is a different frame and enlarged the artwork surrounding the portrait was not included. The 1969 North American Mercury release removes a short hidden track, between track 2 and 3. On the UK Philips edition this piece of music was, as indicated by the groove rills, at the beginning of the third track "Letter to Hermione", yet was timed as being part of the second track. 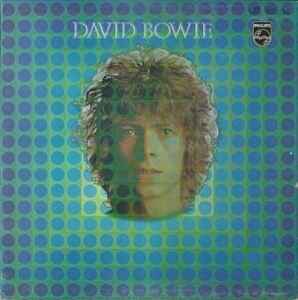 In 1972 following Bowie's commercial breakthrough, the North American version, without the hidden track, was re-released by RCA titled after the album's hit, "Space Oddity", and with a then current facial portrait photo on the cover. Rear cover art, when including timings, still included the hidden track even though it was not present on any RCA issue. This title and cover art version had international re-releases in 1984 by RCA. In 1990, using the same front cover as the 1972 RCA issue, the album was issued by RYKO and subsequently EMI with the hidden track subsequently restored and named for the first time - "Don't Sit Down". All later official editions contain the music as presented on the original 1969 UK Philips album - and post 1997 most do not name the hidden track. In 1999 EMI and Virgin re-released the album with the 30 year old 1969 cover but with the 1972 title. Finally, in 2009 for the 40th Anniversary edition it was re-released by EMI and Virgin with title and cover art exactly as the original UK release. The musicians on the album were hired for the sessions and included among others Herbie Flowers, Rick Wakeman, Tony Visconti and members of the band Junior's Eyes, who would act as Bowie's band promoting the album. While the album didn't chart in 1969 and was considered a commercial failure, the 1972 re-release charted in 17th position on the UK charts. Ok hipsters, I think the matrix numbers are written wrong. its not T6 its TG. trying to determine if this is the exact version of space oddity that i have. everything about the runout numbers match on both sides except one small difference. side 1 clearly has 4S A4 and 1 stamped. side 2 has 2S stamped and 1 stamped as well, but the 3rd identifier on side 2 does NOT look like an A3--almost looks like 2G, but harde to say. i have been able to find no other versions whose numbers match more closely other than this small discrepancy. any info would be appreciated. I am trying to understand how this is considered a re-press? This album did not sell very well when originally released so a repress (by definition) a month later would seem unlikely. With that in mind, where has this release date of Dec 1969 come from? I can find no reference to a second release on this date. At best this should be classed as label variation 1st press as everything (including cat. no, matrix, cover...) is the same as the Nov 1969 issue, except the publishing credits. By definition I believe a label variation is not a repress (take Led Zeppelin - Led Zeppelin for example). Going back to the publishing credits, now this is where I could be wrong, but would it be more likely that a label where there is mention of Copyright Control, would be the original 1st press? I say this because this would imply that Copyright Control has yet to issue publishing credits to songs (as in this issue) but this has been resolved later, as in the other label where all publishing credits are now assigned to Essex Music. Also the only songs credited to Essex Music on this variation is Space Oddity & Wild Eyed Boy From Freecloud; The A-side and B-side respectively of the 1st pressed 45, which is clearly publish credited to Essex Music on the 45 label. This means there was no doubt where the credits lie with these two songs, but on original release of the Album, credits for the other songs were still Copyright Control pending and that why you have this label variation. (also no other “Philips” labels from other countries where credits are assigned to Essex Music, have Copyright Control noted on their labels. For example the South African press (1970) credits Essex Music only; if this UK label in question was a repress from Dec 1969, then surely the South African press from 1970 would also state Copyright Control to the same 7 songs). Also with fewer people having this version may suggest that it is in fact a rarer original 1st press (but I stress this is only my opinion based on observation and logic). If no one can authenticate and prove that this was indeed released in Dec 1969, then based on the comments I have made (and research I have conducted) I would like to submit a vote to amending this listing to 1st press – label variation, or even 1st press with comments section suggesting "original 1st press before full credits were assigned solely to Essex Music". In any case this certainly should not be considered a Re-Press. Any comments would be greatly appreciated as I could be wrong and wouldn’t want to flood misinformation on this listing before I submit an update. The sound on this is of great quality. My gripe is that it skips on A1 once and A2 twice. The cataloque number of this release SBL 7912 is not on the label pictures. A gorgeous package and really nice pressing. Highly recommended reissue. My copy is mis-labelled with Perry Como: And I Love You So on the A-side, which is unusual.